Munich Film Festival: Best National Director; Bavarian Film Awards: Best Young Actor, Jonas Dassler; three other wins, 8 other nominations. 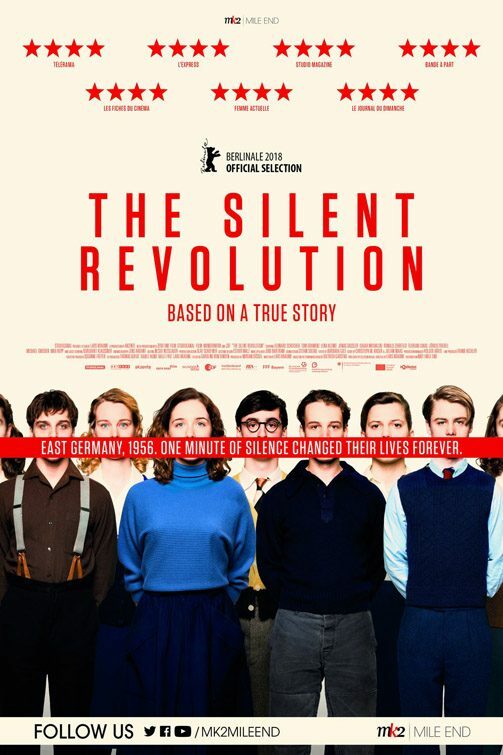 Lars Kraume’s “The Silent Revolution” is based on a true story set in post-war Germany. Theo (Leonard Scheicher) and Kurt (Tom Gramenz) are two teenage East German lads who travel to West Berlin to visit the grave of Kurt’s grandfather, a former SS officer. (This is pre- Berlin Wall.) Before going home, the curious boys decide to go the cinema where they see a newsreel about the 1956 Hungarian Uprising as told from the West German point-of-view. It is a deadly violent affair. Among the victims is a revered soccer star. The boys can’t wait to share the shocking news with their East German classmates. Theo and Kurt get their classmates to participate in a silent protest as a way to commemorate the victims. Since every action in East Germany was inherently political, their odd behaviour ends up being investigated by a host of authoritarian figures. The higher-ups decide to give the entire class only one week to reveal the person responsible for the idea, or everyone will be banned from ever graduating in all of East Germany. The ripple effect of a seemingly quite innocent idea and the subsequent, disproportionate reaction to it is fascinating to watch. “The Silent Revolution” deftly lies out the story’s complex socio-political and historical background, illustrating the differences between 1950s East and West Germany and between post-war Germany and the recent Nazi past. “The Silent Revolution” is an insightful look at a little-known chapter in Germany’s not-so-distant past. Thank you to our Sponsor: Wojo’s Mojo. You can find it on Facebook!